San Diego destination for classic French cuisine. 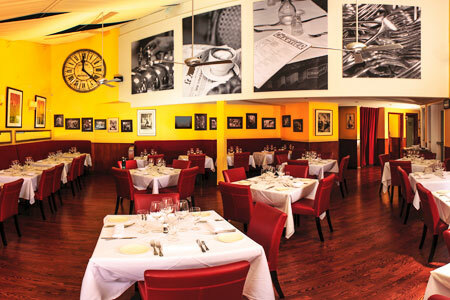 : Tapenade continues to set the bar for classic French food in San Diego. With chef Jean-Michel Diot, previously famed for his stints in France and New York City, happily entrenched in La Jolla, Southern Californians are able to experience his melding of well-practiced European technique and fresh ingredients in the renovated dining room. Classicists will go for the escargots de Bourgogne, artisanal charcuterie and cheeses, and caviar Petrossian with potato blini. We prefer to start off with the intensely flavored wild mushroom ravioli in port sauce, or one may consider the beef carpaccio, arugula salad and Parmesan. Entrées of note include the coq au vin, the ultimate in sophisticated comfort food; and lobster served with white corn, porcini mushrooms, English peas and Tahitian vanilla lobster sauce. “Plats du Jour” bring osso buco on Wednesdays and bouillabaisse on Fridays. Meanwhile, the Bar & Bistro menu proposes plates like shrimp cocktail and lamb sliders. Crème brûlée is the must-have dessert at Tapenade: this thick confection topped with burnt sugar virtually transports us to Paris.